Colby makes Wisconsin proud. Cheesemakers in the central Wisconsin town of Colby dreamed it into existence in the late 1800s, and if there were a state cheese colby would be a frontrunner. 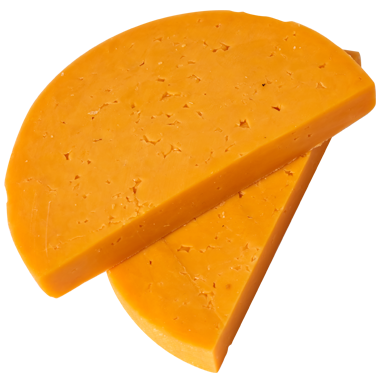 Many think of it as a milder form of cheddar, because the cheese making processes are similar. It’s tender, it’s lacy, it’s a perfect melter, and most importantly, it makes everything you put with it tastier. "Longhorn" refers to the popular large cylinders of colby. Sometimes cheesemakers form cheddar the same way. At the market, "Longhorns" are usually sliced into half-moons or sometimes even sticks. Colby is a mild, crowd-pleaser of a cheese, so it’s friendly with all sorts of drinks. If you''re wanting beer, go for a pilsner, pale ale, brown ale or lager. Wines that pair well with colby include cabernet sauvignon, chianti, pinot noir, red zinfandel, champagne, riesling and malbec. If you prefer the strong stuff, tequila reposado and rye whiskey are definitely good bets. Fold some grated colby into your next batch of savory biscuits and enjoy them any time of the day. They won’t last long. Colby is also an excellent slicing cheese, so you can stack it high on sandwiches. We especially like it straight-up as a snack with crisp, slightly sour apples.